‘Tis the time of year for work planning, and at CED it’s something we look forward to with relish. We use a simple, collaborative, action-oriented process to discuss our key messages, services, internally funded projects, and personal development goals. A similar process will be used in the future to dig into our brand, metrics, client relationships, and more. Incorporating elements of design thinking, strategic doing, and playing to each other’s strengths is both useful and an opportunity to continue to develop and test our tools. We decide our key messages for the coming year -- what matters to us as humans, as an organization, and to Alaska. This sets the foundation for all proceeding conversations, and establishes the message we will carry throughout all of our work in 2019: Entrepreneurship builds economies. Then, we map our services according to revenue in and impacts made, discussing what’s working, what’s not, and what should we invest in expanding or adding to our repertoire along the way. The matrix captures a moment in time - for example, we only recently began work in strengths coaching and are still developing our strategy for design thinking but expect both services to continue to grow in 2019. Right now though, as services to clients they’re low revenue and low impact. 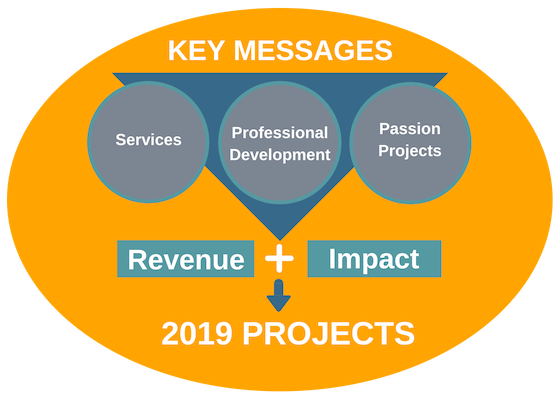 We compare the services we are interested in to those on our impact-revenue matrix and discuss how and if they align, and whether or not the services that were not selected by anyone should be offered moving forward. From here, we moved into a discussion of what we call our “passion projects” - these are generally non-funded, or have a partner who defrays some cost but not all. Examples from 2018 include State of Entrepreneurship and Women and Entrepreneurship reports. Not all organizations have the opportunity to invest in their own projects - we are fortunate to be able to do so, and consider these projects some of our most important work in advancing impactful conversations about entrepreneurship and economic development in Alaska. Our next exercise is to select the three services each of us is most interested in providing, two internal projects we’d like to champion, and an unlimited number of professional development goals (each of us chose between 3-5, which run the gamut from attending classes and achieving certifications to simply reading and writing more). We compare the services we are interested in to those on our impact-revenue matrix and discuss how and if they align, and whether or not the services that were not selected by anyone should be offered moving forward. Next, we group goals and projects on sticky notes and discuss how they align with our key messages. With the insights from this process, we determine where we’re going to be investing our time, money, and energy during the year to come. From there, we identify champions for each grouping, and plan opportunities to continue the discussion and work toward meeting the goals. 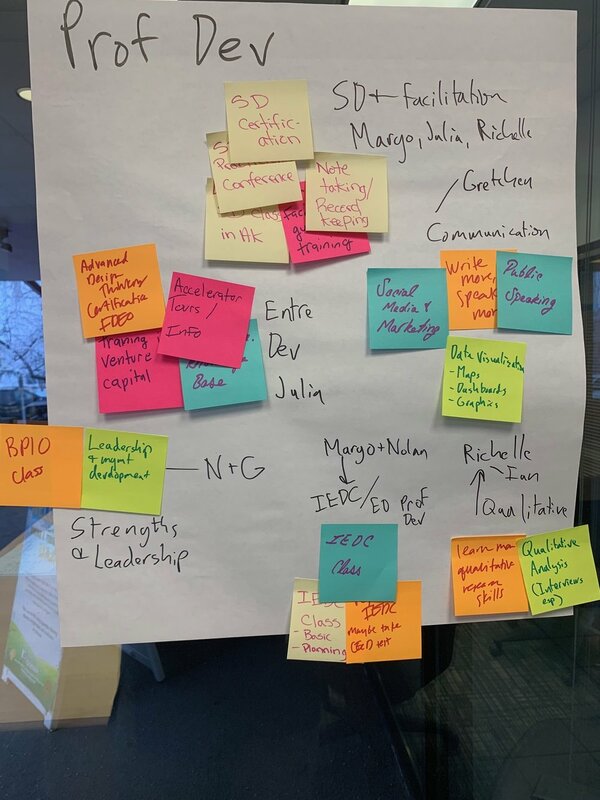 The outcomes of this exercise were not surprising - each of us is working in areas we’re already invested in and excited about, and projects and professional goals all flow nicely together and overlap with others. We came away from our planning session feeling excited about 2019 and all the fun projects we’re going to work on together!